EA010 General Purpose Module for connecting to isoPods or direct analog inputs (such as a UV detector). ER825R: Two Channel Contactless Conductivity Detector with PowerChrom software, for capillary electrophoresis, microchip electrophoresis and chromatography-type applications. Installed with one EA010 and one EA025 module. 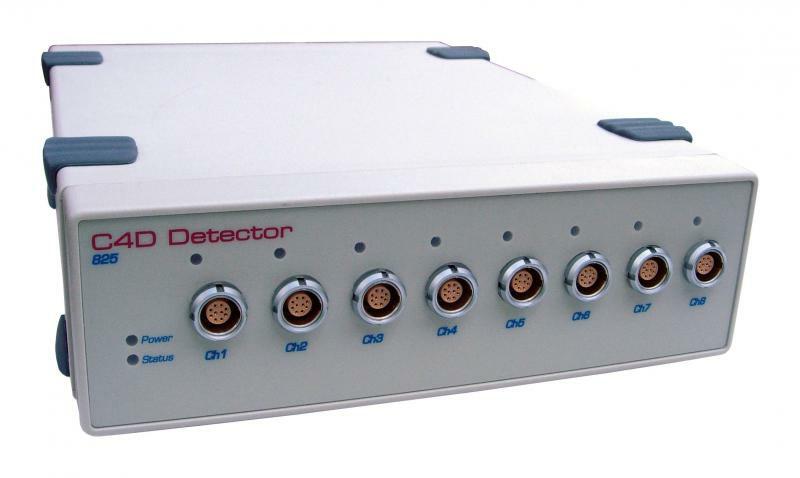 ER825C: Multi-Channel Contactless Conductivity Detector with Chart software (maximum of 8 channels), for flow injection analysis and conductivity monitoring applications. ER825: Multi-Channel Contactless Conductivity Detector, for people wishing to use third-party software to record the data. This includes ChemStation from Agilent, 32 Karat from Beckman Coulter and LabVIEW (using the virtual serial interface over USB connection to computer). In this configuration, the ER815 provides both analog and serial data output. Users can change the configuration of their ER825 themselves at any time, from using eDAQ software to third-party software or vice-versa, using the ER8x5 Converter and Updater software. The unit should be purchased with the required number of EA010 and EA025 Modules. Systems can be expanded or reconfigured at the nearest eDAQ office.